Stay up, stay active and stay energized with the restoring support of FUTURO™ Therapeutic Open-Toe Knee-Length Stockings for Men and Women. These compression stockings help provide the relief and circulation you need whether you’re on your feet for an extended period of time or just sitting in one place all day. Firm compression helps relieve discomfort from tired, achy legs and varicose veins, while an open toe lets your foot breathe. Designed to keep you moving at your regular pace, FUTURO™ Therapeutic Open-Toe Knee-Length Stockings for Men and Women offer soothing comfort for all-day wear. 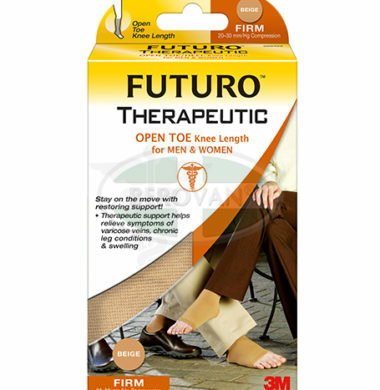 Stay up, stay active and stay energized with the restoring support of FUTURO™ Therapeutic Open-Toe Knee-Length Stockings for Men and Women. These compression stockings help provide the relief and circulation you need whether you're on your feet for an extended period of time or just sitting in one place all day. Firm compression helps relieve discomfort from tired, achy legs and varicose veins, while an open toe lets your foot breathe. Designed to keep you moving at your regular pace, FUTURO™ Therapeutic Open-Toe Knee-Length Stockings for Men and Women offer soothing comfort for all-day wear.